Almost as much pleasure can be had reading about cocktails as drinking them. Almost, but not quite. But some books come very close, and one of my favourites is the Experimental Cocktail Club‘s eponymous guide to their philosophy of drinking culture. This book is beautiful, and even if some of the drinks use ingredients you may not care to attempt at home (bacon-infused bourbon? ), the whole volume is a brilliant shop window for the way they set about crafting drinks and venues with the same care and attention throughout. The Vieux Rectangle is barman Arthur Combe’s signature cocktail. 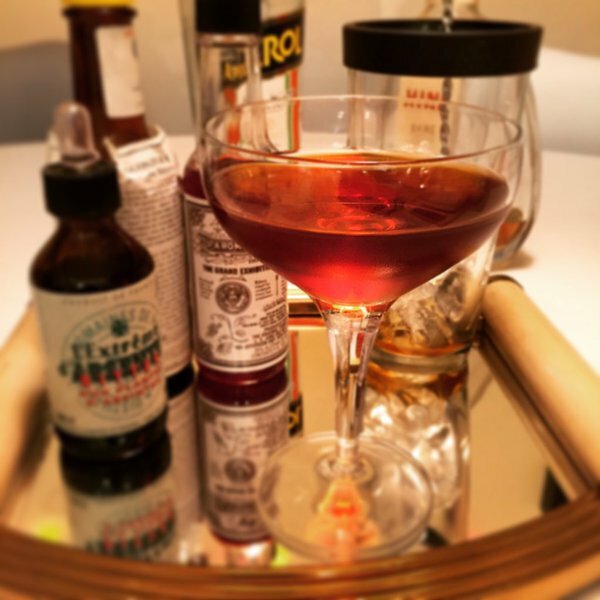 This is his twist on the classic Vieux Carré, with a European interpretation. The result is a fairly sweet concoction on the floral and delicate side, with an anise finish. What stops this drink from being too sweet is the clever addition of Absinthe. The aniseed, spiky flavours cut through the sweetness to deliver a little cleansing note with great precision. Not a cocktail to be enjoyed in quantity, perhaps, buy certainly sipped & admired. When Absinthe is used in a drink in such small quantities as here, I use an Absinthe bitters, Extrême d’Absente for the flavour. Stir over ice in your mixing glass with a bar spoon. Strain into a coupe, then garnish by squeezing lemon zest over the surface to release the lemon oils, then discard.